Olecranon fractures result from a direct fall onto a flexed elbow. As the triceps inserts upon the olecranon, most olecranon fractures tend to be displaced. These fractures are not generally comminuted. A Lateral radiograph of the elbow. 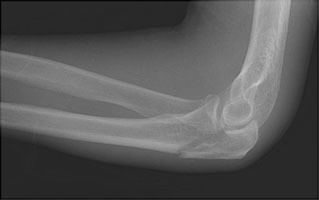 The typical appearance of an olecranon fracture. The triceps tendon has distracted the fracture fragments. B Oblique radiograph of the elbow. This image also demonstrates the olecranon fracture.